The last rites of former Prime Minister Atal Bihari Vajpayee will be performed at Smriti Sthal in New Delhi today. The BJP stalwart died on Thursday at AIIMS where was hospitalised since June 11. Political leaders, including PM Modi and Rahul Gandhi, expressed their grief over the demise of former PM. Political leaders are arriving at the official residence of former PM to pay their last respects. Check latest updates. All the tallest leaders from the BJP and the Opposition came together to pay homage to the deceased BJP stalwart. From former PM Manmohan Singh and Congress president Rahul Gandhi to Vice President M Venkaihan Naidu and LK Advani, almost the entire political fraternity was present at the Smriti Sthal in New Delhi. The foreign dignitaries were also present at Smriti Sthal to pay their last tribute to former PM Atal Bihari Vajpayee. King of Bhutan Jigme Khesar Namgyel Wangchuck, former Afghanistan President Hamid Karzai and Sri Lanka’s acting Foreign Minister Lakshman Kiriella attended the last rites of Vajpayee. The last rites of Bharat Ratna Vajpayee were performed by his adopted daughter Namita Bhattacharya. His daughter lighted the funeral pyre and the former PM was laid to rest with full state honours. August 17, 2018, marks the end of an era and the entire country pays adieu to the remarkable leader. 05 : 07 pm | Former Prime Minister Vajpayee cremated with full state honours at Smriti Sthal in Delhi. 04: 35 pm | Vajpayee’s adopted daughter Namita Bhattacharya lights the funeral pyre. 21-gun salute offered to former PM Vajpayee. 04: 35 pm | The mortal remains of the departed leader wrapped around with tricolour were handed over to his granddaughter Niharika. 04; 29 pm | Among the BJP stalwart, BJP president Amit Shah and senior leader LK Advani paid their homage to deceased BJP leader. 04: 22 pm | King of Bhutan Jigme Khesar Namgyel Wangchuck pays last respects to former PM Atal Bihari Vajpayee at Smriti Sthal in Delhi. 04: 12 pm| Lok Sabha speaker Sumitra Mahajan and Defence Minister Nirmala Sitharaman pay their homage to deceased BJP leader at Smriti Sthal. 4:07 pm| Prime Minister Narendra Modi pays his last tribute to the poet PM of India at Smriti Sthal. 4:04 pm | Army Chief General Bipin Rawat, Navy Chief Admiral Sunil Lanba & Air Chief Marshal Birender Singh Dhanoa pay their last tribute to the deceased BJP leader. 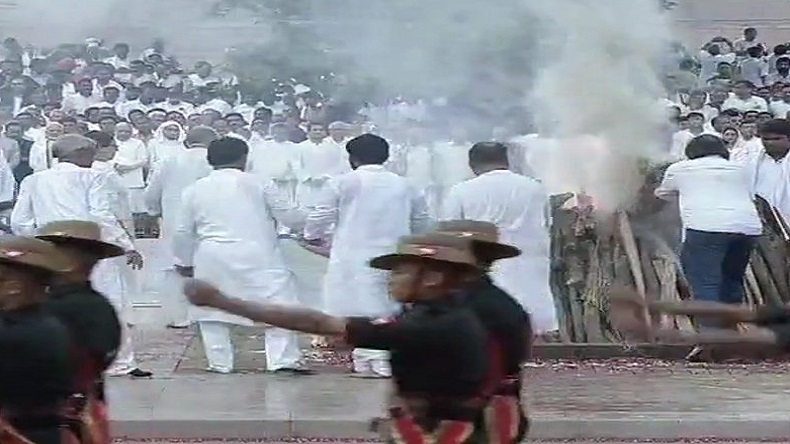 3:57 pm | Last rites ceremony of former Prime Minister Atal Bihari Vajpayee underway at Smriti Sthal. 2:53 pm | Watch: The final procession of former PM Atal Bihari Vajpayee. His mortal remains are being taken to Smriti Sthal for last rites. 3:00 pm | RSS chief Mohan Bhagwat reaches Smriti Sthal. 2:53 pm | Bihar Chief Minister Nitish Kumar and Union Minister Smriti Irani reach Smriti Sthal. 2:40 pm | The funeral procession of Atal Bihari Vajpayee crossed ITO, New Delhi. 2:05 pm | The mortal remains of former PM Atal Bihari Vajpayee are being taken from BJP headquarters to Smriti Sthal for the funeral. Prime Minister Narendra Modi, BJP president Amit Shah are also taking part in the procession. 1:07 pm | Sri Lankan acting Foreign Minister Lakshman Kiriella arrived in New Delhi to attend the funeral of former Prime Minister Atal Bihari Vajpayee. 12:55 pm | Aam Aadmi Party (AAP) leaders like Delhi Chief Minister Arvind Kejriwal, Deputy Chief Minister Manish Sisodia, Rajya Sabha MP Sanjay Singh paid their tribuetes to former PM Atalji at BJP headquarters. 12:45 pm | CPI(M) General Secretary said that it was the speciality of Atal ji that he never let humanity be harmed due to the political and ideological differences, adding that such a principle is needed in the country today. 12:20 pm | To attend the funeral of former Prime Minister Atal Bihari Vajpayee, Nepal Minister of Foreign Affairs Pradeep Kumar Gyawali arrived in New Delhi. 12:05 pm | Senior BJP leader LK Advani paid his tribute to friend and late former PM Atal Bihari Vajpayee. Expressing his grief on the demise of BJP stalwart, the BJP leader said that he will miss his friend for 65 years. 12:00 pm | In this video, Prime Minister Narendra Modi recalls his days with late BJP stalwart Atal Bihari Vajpayee. Watch now. 11:40 am | Chief Ministers from BJP ruled state, including Chhatisgarh CM Raman Singh and Maharashtra CM Devendra Fadnavis paid their tributes to late former PM Atal Bihari Vajpayee. 11:35 am | National Conference leader and former Chief Minister of Jammu and Kashmir, Farooq Abdullah, speaking on the Pakistan policy of Atal Bihari Vajpayee, said that he wanted good relations with Pakistan, adding that he hopes that Imran Khan will fulfil his dream. 11:15 am | Prime Minister Narendra Modi, BJP president Amit Shah, Union Home Minister Rajnath Singh, Union Minister Suresh Prabhu, UP Chief Minister Yogi Adityanath, Ram Naik, and Ram Madhav paid their last respects to former Prime Minister Atal Bihari Vajpayee at BJP Headquarters. 11:00 am | The mortal remains of late former Prime Minister Atal Bihari Vajpayee have been brought at BJP headquarters in New Delhi. Former PM’s last rites will be performed at Smriti Sthal at 4:00pm today. 10:55 am | Bhutan’s King Jigme Khesar Namgyel Wangchuk, Nepal’s Foreign Affairs Min PK Gyawal, Sri Lanka acting Foreign Minister Lakshman Kiriella, Bangladesh Foreign Minister Abul Hassan Mahmood Ali and acting Law Minister of Pakistan Ali Zafar will arrive in Delhi today to pay tributes to former PM Atal Bihari Vajpayee. Bhutan's King Jigme Khesar Namgyel Wangchuk, Nepal's Foreign Affairs Min PK Gyawal, Sri Lanka acting Foreign Min Lakshman Kiriella, Bangladesh Foreign Min Abul Hassan Mahmood Ali & Pak Law Min Ali Zafar will arrive in Delhi today to pay tributes to former PM #AtalBihariVajpayee. 10:41 am | According to ANI reports, the Delhi High Court and all districts courts will function till 1:00pm today. The competent authority has decided that there will be a half-day holiday today to allow officials and staff to attend the funeral of late former PM Atal Bihari Vajpayee at Smriti Sthal today. Delhi High court & all District courts to function till 1 pm today. The competent authority has decided that there will be half-day holiday today to allow officials & staff to attend the funeral of former PM #AtalBihariVajpayee at Smriti Sthal. 10:30 am | Pakistani Information and Law Minister Barrister Ali Zafar will lead Pakistan delegation to participate in the funeral of late Atal Bihari Vajpayee. 10:20 am | Former Chief Minister of Delhi Sheila Dixit, in an exclusive conversation with NewsX, said that Atalji was very humane, adding that both Atalji and I had a special interest in Delhi. 10:16 am | A large crow of people has joined the procession as the mortal remains of former Prime Minister Atal Bihari Vajpayee are being taken to BJP headquarters. 10:10 pm | Huge crowd of people have joined the procession of former PM Atal Bihari Vajpayee, who is being taken to BJP headquarters for last tributes. 10:00 am | The mortal remains of Atal Bihari Vajpayee are being taken to BJP headquarters. 9:50 am | Prime Minister Narendra Modi arrived at BJP headquarters where Atal Bihari Vajpayee’s mortal remains will be kept for last tributes. 9:48 am | On the demise of former PM Atal Bihari Vajpayee, the Supreme Court has decided to observe half-day holiday today. 9:30 am | People are now being allowed inside BJP headquarters to pay their last respects. 9: 00 am | TDP leader and Andhra Pradesh Chief Minister N Chandrababu Naidu paid tribute to former Prime Minister Atal Bihari Vajpayee. Naidu’s party TDP was part of NDA during 1999-2005 when Atal Bihari Vajpayee was Prime Minister. 8:53 am | Congress president Rahul Gandhi arrived at Atal Bihari Vajpayee’s residence in New Delhi to pay tribute to former PM. 8: 31 am | Recalling his relation with former PM Atal Bihari Vajpayee, owner of Thaggu Ke Laddu, a sweet shop in Delhi, told ANI that his shop was often visited by former PM. 8:30 am | Army Chief Bipin Rawat paid tribute to former PM Atal Bihari Vajpayee at his residence in New Delhi. 8:20 am | “Delhi police has made elaborate security arrangements for the last rites procession. It will be ensured that the people who come to pay last respect and the commuters face minimum inconvenience & that there is no compromise with security,” said Delhi DCP Madhur Verma on arrangements made by Delhi Police for Atal Bihari Vajpayee’s funeral. 8:15 am | RSS chief Mohan Bhagwat paid tribute to Atal Bihari Vajpayee at his official residence in New Delhi. The BJP stalwart was an active member of the Rashtriya Swayamsevak Sangh. 8:10 am | After paying his last respect to Atal Bihari Vajpayee, Javed Akhtar said that very rare that a politician is respected across party lines, adding that people with different ideology have also come as they love him because he used to love all. 8:05 am | Security has been beefed up across the national capital. 8:00 am | Rashtriya Swayamsewak Sangh chief Mohan Bhagwat has reached Atal Bihar Vajpayee’s residence. 7:44 am | Kerala Governor P Sathasivam and Tamil Nadu Governor Banwarilal Purohit reaches former PM’s residence to pay their last tributes to him. 7:30 am | BJP president Amit Shah arrived at former Prime Minister Atal Bihari Vajpayee’s residence where the body of the BJP stalwart has been kept for last respects. 7:20 am | This is how media, particularly major national newspapers, covered demise of former Prime Minister Atal Bihari Vajpayee. 5:20 am | Local in Siliguri paid their tributes to former PM Atal Bihari Vajpayee as BJP stalwart was often called as people’s leader. 2:30 am | DMK leaders like MK Stalin, Dayanidhi Maran arrived in Delhi to pay to their respects to former Prime Minister Atal Bihari Vajpayee. 12:56 am | Sri Lankan acting foreign affairs minister Lakshman Kiriella likely to attend former PM Atal Vajpayee’s funeral in New Delhi today, according to ANI reports.